The Black Bear knife is one of the most unique knives available. Its sharp blade and smooth curves make this knife a rugged yet elegant piece. The finely detailed handle and blade carvings make this an excellent collector's piece as well as a trustworthy outdoorsman's tool. Pricing includes this hand laced leather sheath for protection. 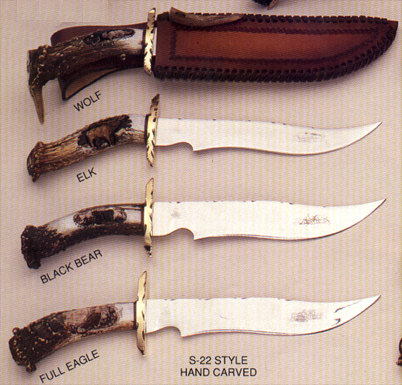 Other handcarved styles shown include the Wolf, Elk, and Full Eagle designs. All designs are one low price each. Add the animal to S-22C for your choices.